Here are some of the shoes that are a result of Rockport’s research. Not only does the company have lines for men and women, they also offer unisex models, which they refer to as “dual gender”. 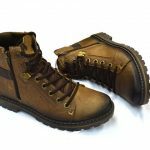 This is a practical, good looking waterproof boot that would not be out of place in urban or rural environments. A rubber outsole allows you to get a good grip on a lot of different surfaces, whether snowy city sidewalks or muddy meadows. That makes this shoe a good choice when the weather is being unpredictable. The 7 inch leather shaft has small D-rings and convenient speed hooks, which make it easy to get the boots on and off. A Thinsulate lining helps to keep you warm and comfy, while your feet will be very grateful for the EVA cushioning that conforms itself to the shape of your foot, making for a very personalized fit. 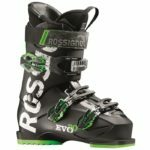 Buyers seem to really enjoy their Explorers High Snow Boots, the only notable complaint being that those with high arches might find the fit a little uncomfortable. If you don’t need quite such a high boot, the Chelsea may be a better choice. The shaft is only 5.75 inches and cozily lined in felt. It also has the EVA cushioning that will mold itself to the shape of your foot and an outsole with an excellent grip. However, this is a pull-on boot that is super easy to put on and take off, helped even more with pull tabs front and back. So if you won’t be traipsing through more than a few inches of snow, the Chelsea should do nicely. It’s worth mentioning that, although this is a very comfortable boot overall, it does run a little large. Some buyers have noted that it slips just a bit too much when walking over longer distances. 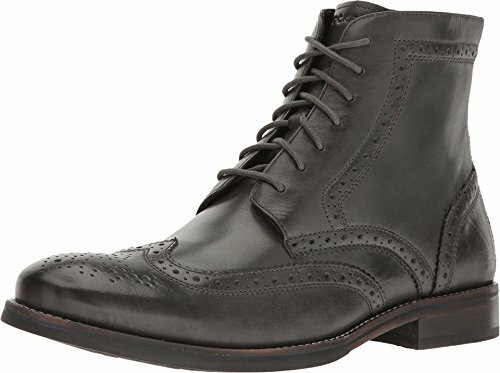 Rockport offers a wealth of choice in men’s boots, from super casual to more than elegant enough for an evening out. And they are all noted for being extremely comfortable. This Chelsea is like a dressier version of the unisex Chelsea Snow Boot. So, if you love the style, you could conceivably have one for casual use and one for more formal occasions. This model has the same comfy EVA foot bed, but the leather upper is sleek and smooth. It also has a textured rubber outsole, but though it is still comfortable, it is not nearly as thick as the casual version and features the distinct heel of a regular shoe. 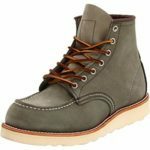 While this boot may not have quite the grip as the Chelsea Snow Boot, it will still do much better on messy surfaces than slick leather soles of most dress shoes. It also doesn’t have a pull tab on the back, but it should still be easy enough to put on and take off. This is a really handsome boot that will still manage to cope in bad weather, but if it shares the same sizing drawback as the snow boot, it might not be comfortable for walking long distances. The Toloni is a very handsome 6.5 inch leather boot that will look equally good dressed up or down, in any of the four attractive neutral color options. They are super comfortable and only need a very short break in period – maybe just wearing them once or twice. Along with the usual EVA shock-absorbing midsole that provides extra stability and support, the Toloni has a long-wearing dual-density rubber outsole with textured rubber pads for a better grip. Yet, though this ankle boot has a lot of comfort features, it does taper and narrow somewhat toward the toe area. The result is a slightly snug fit at the toes which some may find uncomfortable. The problem with this is that the shoe already runs somewhat big, so ordering a larger size to get a more comfortable fit around the toes is probably not an option. 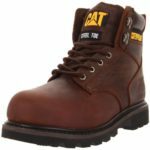 Rockport makes a very decent attempt at a leather 6 inch work boot and, depending on your type of job, it may be perfectly fine. It is certainly comfortable, right out the box, so it doesn’t even require breaking in. It’s also waterproof and comparatively lightweight. The composite toe cap is nice and wide. This boot has a lot more to recommend it, as well. It offers electrical hazard protection, while the outsole is both oil- and slip-resistant. However, there are a few things that may have greater impact on some buyers more than others. There are no speed hooks on this work boot, the eyelets go all the way up the ankle. That makes it just a bit harder for you to get these things on and off. There also isn’t as much arch support as there could be for a work boot, you may find that your feet are more tired after a full day of wearing them. These boots also tend to get a bit hot, but that could just be due to the fact that they’re waterproof, which often has that effect. But for those working in warmer climates and environments, this could turn out to be an important factor. Overall, it’s not a bad boot. And it’s available in several colors. Rockport’s women’s line is every bit as stylish and comfortable as the men’s line, if not more. There is a wide range of styles, from work boots to dressier options. This is a tall 17 inch boot with a comfortable 2 inch wedged heel for a little bit of a lift. It uses beautiful, elegant, and sophisticated high quality suede to achieve a classic aesthetic for a variety of outfits. So you will want to wear these often with your pants tucked in, to get the full effect of the lovely silhouette. Incorporating a retention foam footbed and a foam backed lining, this boot is exceptionally comfortable. But it does run a size too small though, so be sure to keep that in mind when you place your order. The Joy is a super cute 5 inch ankle boot, also with a comfortably low wedge heel of only 1.25 inches. It’s black suede with a patterned brown ankle strap. The rubber sole will give you a good grip and nice traction, while the side zipper lets you easily put them on and take them off. These boots will work in any number of settings and are comfortable enough even for a full day at work. Definitely a keeper. The Catriona is a new model for Rockport, and it is an excellent addition to the women’s line. This lightweight 5.5 inch boot has a 2.5 inch heel and a lot of comfort features. The heel is cushioned, in order to provide excellent shock resistance, in addition to foot support. There is also a retention foam foot bed a lightweight rubber outsole. All of these combine to keep your feet from aching, even when running around in heels all day. The Catriona is a sleek, yet stylish boot. However, some buyers thought that it could do with a little extra cushioning for the balls of your feet. Fortunately, some of them found that adding insoles was enough to solve the problem. Your mileage may vary. 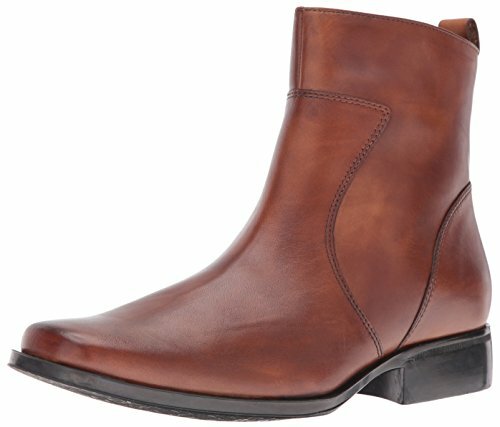 If there was ever any doubt that Rockport could create a high-fashion boot, the Ally Stud Bootie is enough to banish it. This is an extraordinarily stylish boot and it is amazingly comfortable, particularly for any shoe sporting 3.5 inch heels. Rockport incorporates advanced technology to create a cushioned heel and reduce friction. The hidden dual density soft core platform adds even more shock absorption and flexibility. As though all of that weren’t enough, a rubber outsole give you a really good grip on all kinds of surfaces. Just a slim line of studs trimming the leather uppers adds a startling amount of style to an otherwise sleek ankle boot. An inside zipper makes for supremely easy on and off. The Ally runs true to size and has only raves from buyers. No complaints about anything. Rockport’s women’s More Energy Comp Toe Work Boots are very similar to the men’s version, with all of the same advantages and drawbacks. 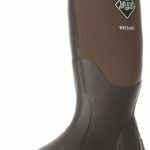 The waterproof 6 inch boot has an extra-wide composite toe that is very comfortable. So is the nylon mesh moisture wicking lining and shock-absorbing EVA cushion insert. The rubber outsoles not only have great traction, they are resistant to slipping, oil, heat, abrasion, chemicals and even metal chips. Unfortunately, they don’t have speed hooks, either. The eyelets go all the way to the top of the boot, which makes it a little more time consuming to put on and take off. Since the boots are waterproof, they can get hotter than those that aren’t. If those aren’t deal breakers, then this is a pretty decent work boot and it’s available in two colors.